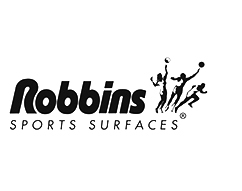 Robbins Sports Surfaces, based in Cincinnati, USA, is the premier manufacturer and supplier of high performance maple and synthetic sports flooring. Flooring systems from Robbins have been supplied to the NBA, WNBA, NCAA, arena, education, religious and fitness markets. In more than 65 nations on six continents, athletes compete and practice on millions of square meters of Robbins’ sports surfaces. Professional and amateur alike know that when they play on a high performance Robbins’ system they’ll be able to play at peak levels, safely and comfortably. Robbins strongly upholds their corporate values which are; Integrity, Courtesy, Responsive, Professional and Progressive.Robbins lives these values every day. Robbins passion and purpose is to design and deliver sports flooring systems to the benefit of the user and owner at every level of play through: Enhanced Safety, Increased Comfort, Reduced Fatigue, Fantastic Game Play Response, and Low Total Cost of Ownership. More NBA teams compete and train on Robbins court than all other competitors combined. 21 of the past 25 NBA Champions played their home games on a Robbins’ court. 13 of the 16 2012 NBA playoff teams compete and/or train on a Robbins’ court.